The first time I visited Trade was back in May 2012, about 6 months after the grand opening. My friend and I split a few items, including the burrrata, tomato & fennel soup, Trade’s famous lamb & sausage flatbread, and a chocolate budino for dessert. I enjoyed everything we ordered but never found my way back to 540 Atlantic Ave. This is no way reflects the menu items, but has more to do with the fact that the Boston restaurant scene is booming, and I’m trying (and failing) to keep up with all of the new openings. I was lucky enough to recently meet Meghan Brady at last month’s Helping Hands event, sponsored by the Columbus Hospitality Group. Meghan is Trade’s Events & Marketing Manager, and she invited me into Trade last week to chat with her and indulge in some of Trade’s signature fall favorites. I just adore soup so I’m typically a tough critic when it comes to this fall / winter staple. 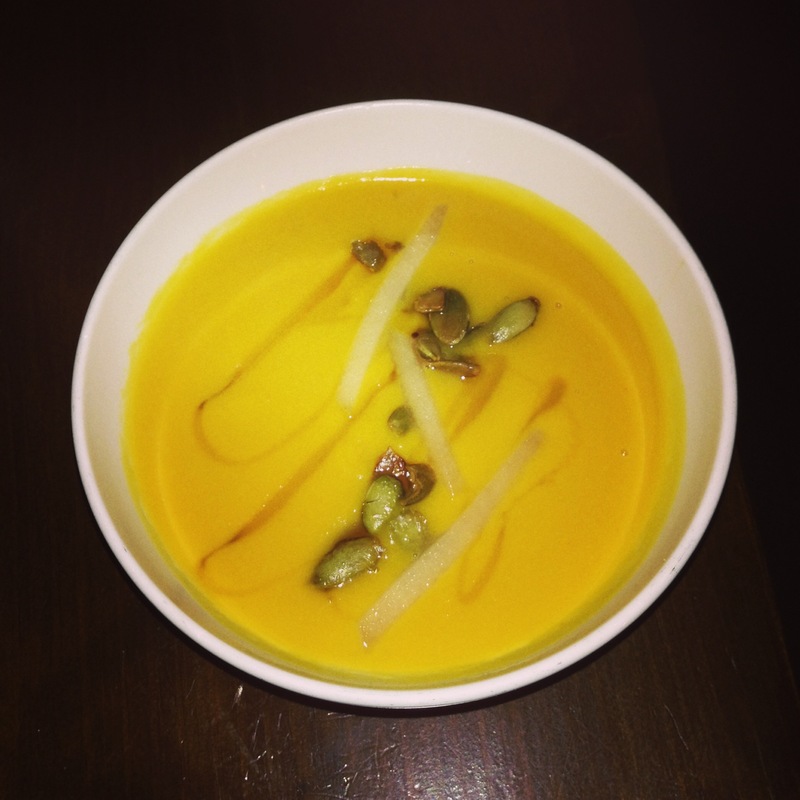 I prefer purées topped with some sort of added crunch or texture, and that’s exactly what I got with Trade’s pumpkin soup. The consistency was perfectly smooth without being too thin or watered down. The honey added a slight sweetness, and the apples and pepitas provided that level of texture I always look for. Three meatballs came in a cheesy tomato sauce. Not only were the meatballs surrounded by pine nuts, but they also contained pine nut purée, adding flavor and moisture to the meat. 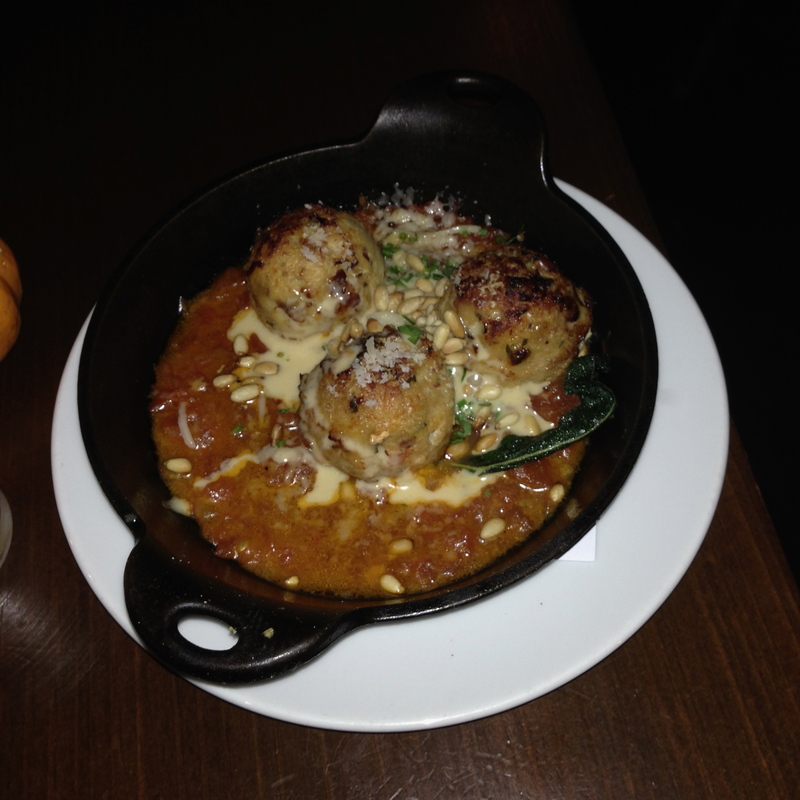 Chicken meatballs aren’t a menu selection I see often, so I’m glad we ordered these. Highly recommended! 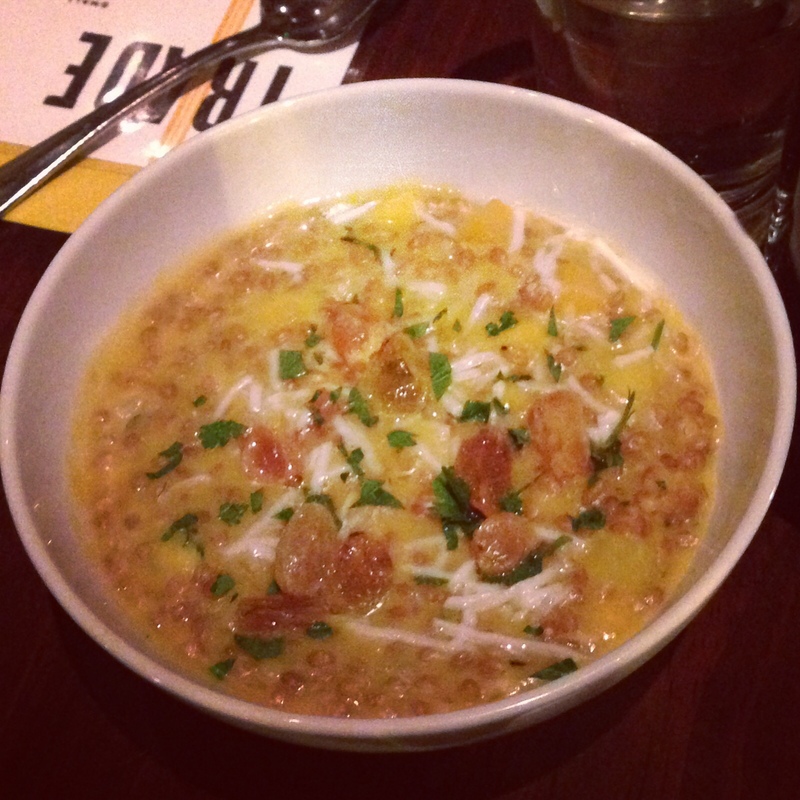 I have never heard of Farrotto before, and that’s because it’s a hybrid of farro and risotto. Brilliant! This dish is exactly what I’m looking for on a cool fall day: packed full of winter squash, cheesy, buttery, and a great comfort food appetizer. I highly suggest ordering this as a starter or side to split; it’s decadent and a must try. 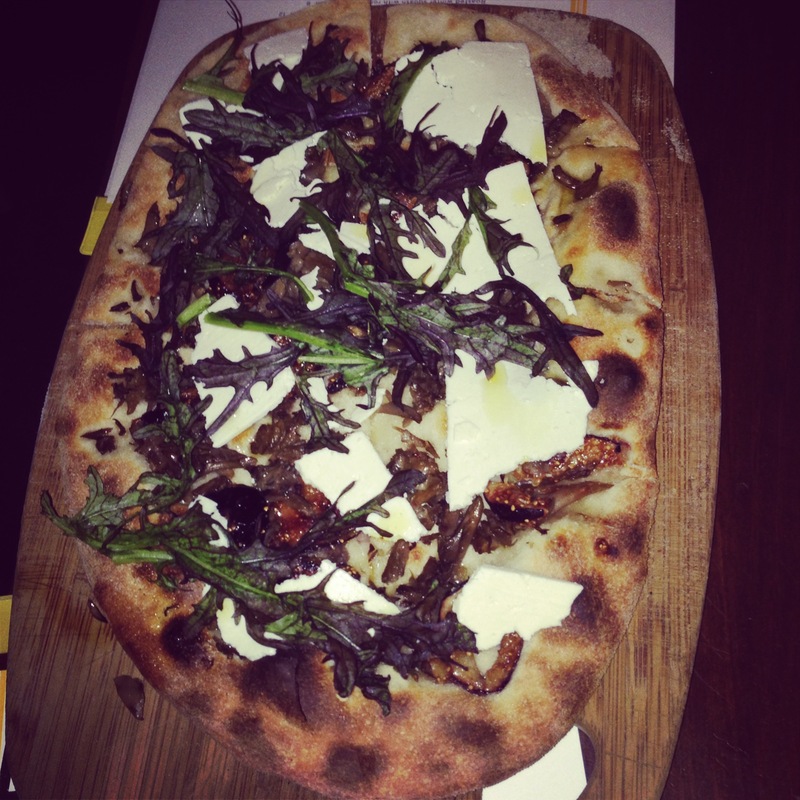 I really wanted to try a flatbread, and this one sounded so tasty. Too bad I can’t have Gorgonzola cheese (damn pregnancy rules); so in its place I substituted ricotta salata. It was definitely good, but I’m pretty sure it would have been 10 times better with the Gorgonzola. You just can’t substitute that type of flavor! I couldn’t leave without trying at least one entree, so we ordered the short rib. The picture doesn’t really do it justice since you can’t get a good view of the meat, but just as you’d hope and expect, it pulls apart easily and basically melts in your mouth. 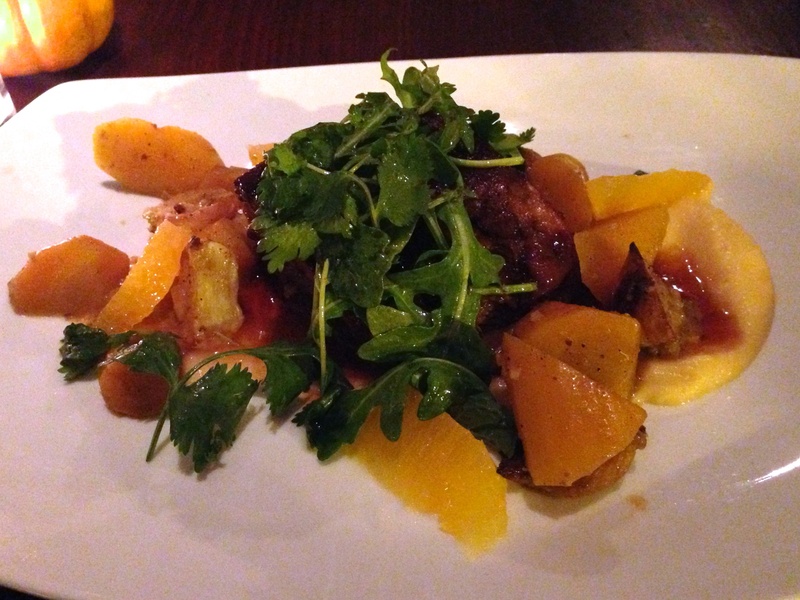 This dish had great levels of flavor with the curried carrots, tangy orange, and savory meat. 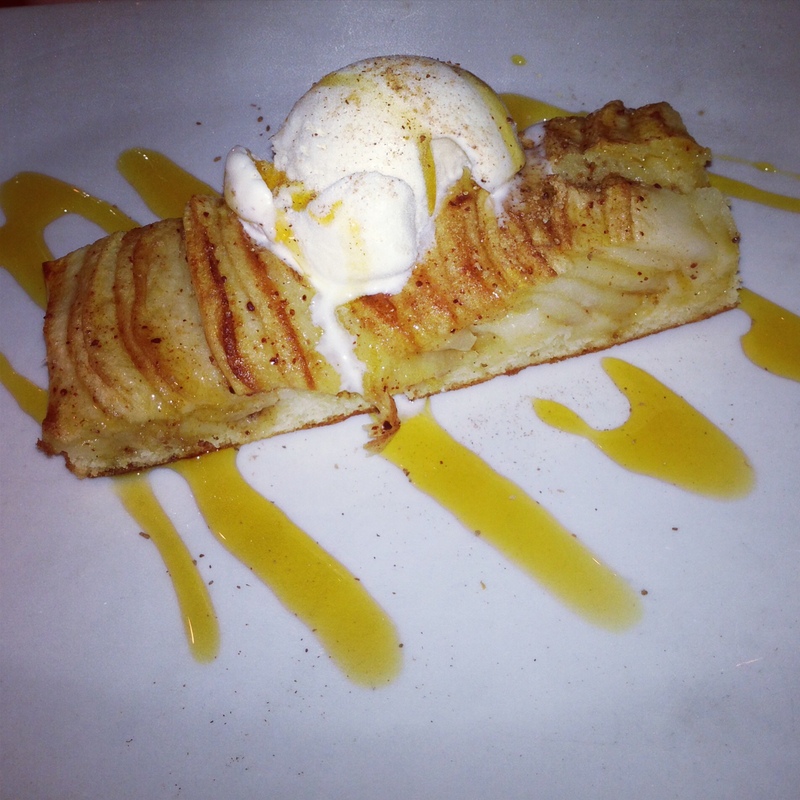 And last but not least, I was kindly treated to a birthday Apple Cake, as it was the day before my big 30th. What a great way to end a ‘flavors of the fall’ inspired meal. Trade has a great menu for splitting dishes among a group, but also offers enough entrees so you don’t have to feel pressured to share. The restaurant space is an open concept, so the bar and lounge blend into the dining area, which keeps the entire atmosphere lively and energetic. Trade’s private dining room is separated from the restaurant by a floor-to-ceiling glass wall. When it’s not occupied by a large group, the space is available for every day diners. Serving lunch and dinner daily, Trade has a variety of options that can please everyone in your crowd. Keep you eyes peeled, possibly next summer, for some potential outdoor patio space!